Peter and Paul Snowden trained two-year-old Anaheed claimed her third win at Randwick on Saturday in the Group 2 Percy Sykes Stakes (1200m). The filly by Fastnet Rock lapped up the firm track to win in a photo finish over the dazzling Flit, who flashed home late on the outside to fall short by a nose. Anaheed, who won the Group 2 Sweet Embrace Stakes at Randwick last month entered Saturday’s race at $9.00 odds with Ladbrokes, making up a talented field of two-year-olds. Punters were spoiled for choice with six single-digit chances, but according to Paul Snowden, it was Anaheed’s resiliency that saw her over the line first. Anaheed, above, dashes towards the line to win Saturday’s Group 2 Percy Sykes Stakes by a nose. Photo Credit: Steve Hart. “It’s a testament to her toughness. We left it right up until Tuesday morning. The two fillies worked together and there was a cigarette paper between them” Snowden said after the race. Jockey Tim Clark chose to sit on the speed out of the gate but cleverly moved from an early wide position to sit on the fence down the straight. Third place-getter Vilami challenged over the final furlong but faded late as Anaheed and Flit quickened towards the line. 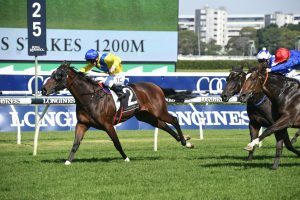 Cheer Leader, who entered as the favourite, chose to dictate the pace, while Godolphin’s Group 1 Golden Slipper winner Kiamichi struggled with the step back in trip. Saturday’s race ran in a time of 1:09.67, a new class record on the firming track. The plan ahead for Anaheed remains unclear, but Snowden says Anaheed’s connections have bigger things in mind. “I always thought she was going to be a better three-year-old. She won her first stakes race on Everest day and here we are now” Snowden said.